Copyright ©2010 Baishideng Publishing Group Co., Limited. All rights reserved. Author contributions: Both authors, Pedrosa I and Boparai D reviewed the current literature, wrote and edited the manuscript. With the widespread use of cross-sectional imaging, particularly computed tomography (CT) and magnetic resonance imaging (MRI), and the continuous improvement in the image quality of these techniques, the diagnosis of incidental pancreatic cysts has increased dramatically in the last decades. While the vast majority of these cysts are not clinically relevant, a small percentage of them will evolve into an invasive malignant tumor making their management challenging. Mucinous cystic neoplasms and intraductal papillary mucinous neoplasms (IPMN) are the most common pancreatic cystic lesions with malignant potential. Imaging findings on CT and MRI correlate tightly with the presence of malignant degeneration in these neoplasms. IPMN can be classified based on their distribution as main duct, branch duct or mixed type lesions. MRI is superior to CT in demonstrating the communication of a branch duct IPMN with the main pancreatic duct (MPD). Most branch duct lesions are benign whereas tumors involving the MPD are frequently associated with malignancy. The presence of solid nodules, thick enhancing walls and/or septae, a wide (> 1 cm) connection of a side-branch lesion with the MPD and the size of the tumor > 3 cm are indicative of malignancy in a branch and mixed type IPMN. A main pancreatic duct > 6 mm, a mural nodule > 3 mm and an abnormal attenuating area in the adjacent pancreatic parenchyma on CT correlates with malignant disease in main duct and mixed type IPMN. An accurate characterization of these neoplasms by imaging is thus crucial for selecting the best management options. In this article, we review the imaging findings of IPMN including imaging predictors of malignancy and surgical resectability. We also discuss follow-up strategies for patients with surgically resected IPMN and patients with incidental pancreatic cysts. The diagnosis of incidental pancreatic cysts has increased dramatically in the last decades because of the widespread use of cross-sectional imaging and the technical developments in these techniques that have allowed for faster imaging of the abdomen along with improved spatial and contrast resolution. 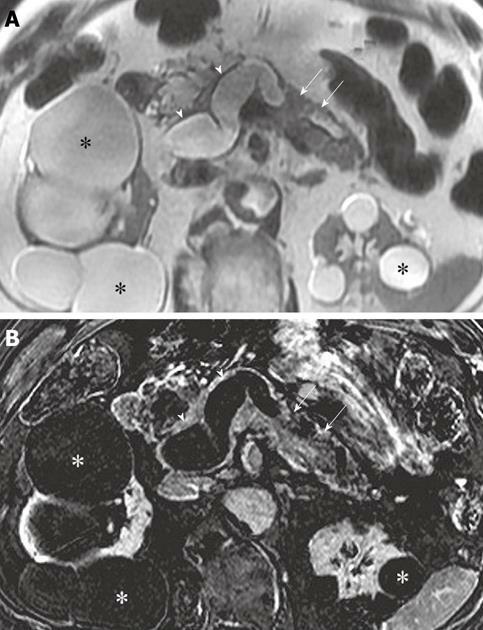 The prevalence of incidental asymptomatic pancreatic cysts may be as high as 3% and 14%-20% in patients undergoing computed tomography (CT) and magnetic resonance imaging (MRI)[2,3] respectively. While some studies support that the majority of these cysts are not clinically relevant[4,5], a small percentage of them may evolve into an invasive malignant tumor[5,6]. The differential diagnosis of cystic lesions in the pancreas is broad and includes non-neoplastic lesions (i.e. pseudocyst) and cystic neoplasms [serous cystadenomas, mucinous cystic neoplasms and intraductal papillary mucinous neoplasms (IPMN)]. Mucin-producing neoplasms, including IPMN, have malignant potential and therefore are considered surgical lesions. Thus, accurate characterization of these lesions is crucial for selecting the best management options. The importance of cross-sectional imaging in the pre-surgical evaluation of IPMN has been extensively emphasized in the literature[7-14]. The tight correlation between imaging findings and histopathological features of these neoplasms, with further sub-classification based on the location and degree of involvement of the pancreas, provides the basis for including imaging in a decision-making algorithm proposed for the management of IPMN. Follow-up imaging strategies for patients with presumed IPMN have been proposed. However, clear recommendations for imaging follow-up in patients with a pathologically-confirmed diagnosis of IPMN after surgical resection are lacking at the present. The aim of this article is to review the imaging characteristics of IPMN, with emphasis on the correlation between cross-sectional imaging findings and histopathology, and to review imaging follow-up strategies for patients with a presumed diagnosis of IPMN and for those with pathologically-confirmed IPMN after surgical excision. 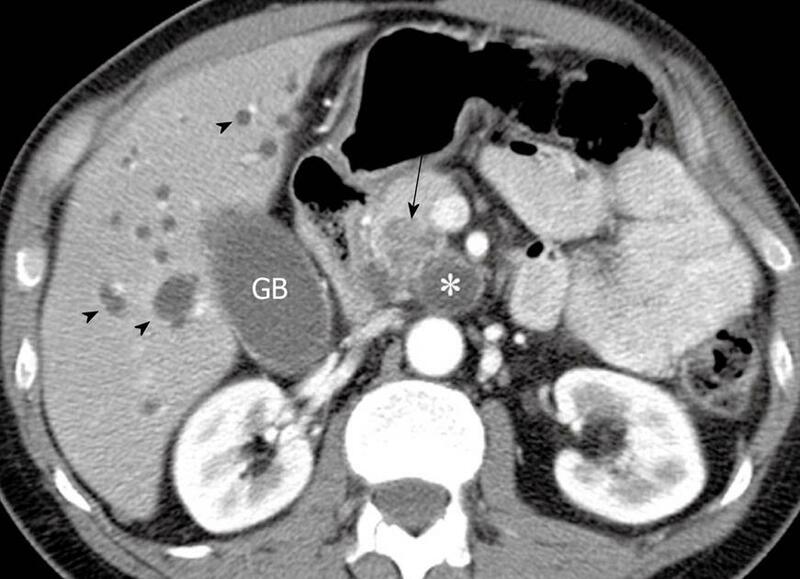 CT and MRI are the most commonly utilized non-invasive imaging techniques for assessment of pancreatic cystic lesions. While ultrasound (US) is an excellent technique for demonstration of the internal architecture in these cysts, the presence of air in overlying bowel limits the utility of this technique transabdominally. For this reason and because of the added advantage of direct sampling capability, the use of endoscopic US has proliferated in the last decade for the evaluation of pancreatic cysts. A dedicated multiphasic, multidetector CT protocol of the pancreas with multiplanar and curved reconstructions is recommended for the presurgical evaluation of pancreatic cysts[14,16,17]. Similar to patients with pancreatic adenocarcinoma, this protocol offers accurate information about tumor staging and vascular anatomy. MRI protocols typically include a combination of T1-weighted, T2-weighted and dynamic contrast-enhanced, fat-saturated T1-weighted images[19,20]. Both thin-slice T2-weighted images and heavily-T2 weighted thick-slab images are acquired, the latter representing cholangiopancreatography images (MRCP) per se. The preoperative characterization of IPMN is challenging and frequently requires a multidisciplinary approach. Understanding the histopathological features of this disease is necessary for the correct interpretation of cross-sectional imaging studies[7,14,22-24]. IPMNs represent a spectrum of neoplasms composed of mucinous cells lining the main pancreatic duct and/or side branches. These tumors are characterized by the mucinous transformation of the pancreatic ductal epithelium which eventually leads to the development of the papillary projections typically seen at histological analysis. Excessive mucin production by the neoplastic cells results in cystic dilatation of the pancreatic duct and/or branch ducts. The spillage of mucin from the ampulla of Vater causing a “fish-mouthed” ampulla is a classic, albeit uncommon, finding at endoscopic retrograde cholangiopancreatography (ERCP). Although the natural history of the disease is not fully understood, a stepwise progression from benign adenomas to low- and high-grade dysplasia, in-situ-carcinoma, and then invasive carcinoma has been proposed[26,27]. IPMNs are also sub-classified as main pancreatic duct (MPD) (both segmental and diffuse), branch duct and mixed-type based on their site of origin and extent of tumor. Most branch duct lesions are benign whereas tumors involving the main duct are frequently associated with malignancy. 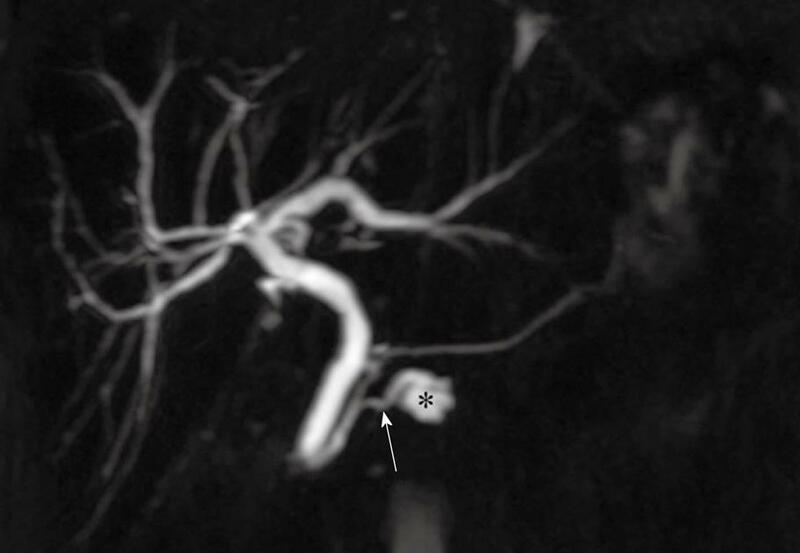 A branch duct IPMN appears as a cluster of small cysts with lobulated margins that may be septated or as a single, unilocular cystic lesion at CT, US or MRCP. Branch duct IPMN is frequently located in the uncinate process of the pancreas although they can be found throughout the entire gland, particularly in the tail. A characteristic communication between the branch duct IPMN and a normal-sized MPD can be seen on MRCP (Figure 1) and CT[11,28]. However, the MPD may also be dilated due to mucin secretion. With chronic obstruction of the MPD, pancreatic atrophy may also be present. Complex features in a branch duct IPMN include a thick, enhancing wall and septae, and nodules. Figure 1 Coronal maximum intensity projection from a 3D T2-weighted MRCP acquisition shows a cystic lesion in the uncinate process of the pancreas (asterisk) and a communicating branch duct (arrow) between the cyst and the normal caliber main pancreatic duct. These findings are characteristic of a branch duct intraductal papillary mucinous neoplasm and this lesion has been stable on follow up MRCP examinations for 3 years. The main duct variant of IPMN can have either segmental or diffuse involvement of the duct. A segmental main duct IPMN may present as a cystic lesion that mimics the appearance of a mucinous neoplasm (i.e. cystadenoma, cystadenocarcinoma). The MPD in patients with ‘cystic’ segmental involvement, however, is frequently dilated because of the secretion of mucin by the tumor whereas the MPD in patients with mucinous neoplasms is typically normal. Commonly, the entire MPD is diffusely dilated because profuse mucin impedes the flow of juice through the pancreatic duct. This phenomenon results in moderate-to-marked dilation of the entire MPD on cross-sectional imaging. Diffuse dilation of the MPD in IPMN is frequently associated with parenchymal atrophy and may be impossible to distinguish from chronic pancreatitis on imaging[23,28]. Similar to ERCP, a prominent papilla may also be present on CT and MRCP. Diffuse wall thickening and enhancement of the MPD is a characteristic of advanced (i.e. malignant) main duct IPMN. Similarly, papillary excrescences or nodules of tumor may be seen arising from the walls of the dilated ducts, although they are often inconspicuous because of their small size and flat configuration. When visible, these nodules are hyperechoic on US, hyperattenuating at contrast-enhanced CT and hypointense on T2-weighted images. Differentiation of mural tumor nodules and mucin globs can be challenging. A non-dependent location of these nodules along the wall of a dilated duct and the unequivocal demonstration of enhancement adds confidence about the presence of mural tumor excrescences (Figure 2). Mucin globs are mobile, do not enhance and are usually dependently located. Further imaging of the patient in different positions (i.e. supine and prone) can be helpful in demonstrating the mobility of mucin globs. Figure 2 Axial T2-weighted (A) and subtraction (post-contrast minus pre-contrast) (B) images at the level of the pancreas demonstrate marked enlargement of the main pancreatic duct (arrowheads) with intraluminal enhancing papillary projections (arrows). Main duct intraductal papillary mucinous neoplasm with in situ carcinoma was confirmed at histopathology after total pancreatectomy. Multiple renal cysts (asterisks). Mixed-type tumors demonstrate a combination of imaging features of branch-duct and main duct IPMN. Differentiation between branch duct and mixed type IPMN can be challenging. The MPD can be dilated both in patients with exclusive involvement of a branch duct by IPMN due to excessive mucin production by the cyst and in patients with mixed type IPMN. Therefore, the differentiation between branch-type and mixed-type IPMN may be virtually impossible. In these cases, the MPD must be carefully scrutinized for the presence of any wall thickening, enhancement or mural nodules that would indicate the presence of neoplastic involvement of the MPD. The presence of malignant components in an IPMN has direct implications on the management of these lesions. Imaging features that are indicative of malignancy in a branch and mixed type IPMN include the presence of solid nodules, thick enhancing walls and/or septae, a wide (> 1 cm) connection of a side-branch lesion with the MPD and the size of the tumor[10,16,29]. Specifically, a branch duct type IPMN greater than 3 cm in surgical specimens or preoperative imaging studies including transabdominal US, CT, endoscopic US, ERCP and MRCP has been correlated with malignancy, including carcinoma in situ and invasive carcinoma[30,31]. Others have found a cyst size > 40 mm as predictor of malignancy. However, the absence of complex features (e.g. septae, nodules, thick wall) and enhancement, particularly on a high-quality MRCP, in an incidental asymptomatic branch duct IPMN likely indicates the absence of malignancy, even for IPMN > 3 cm in size. The presence of a MPD > 6 mm, a mural nodule > 3 mm and an abnormal attenuating area in the adjacent pancreatic parenchyma on CT (Figure 3) correlates with malignant disease (i.e. in situ and invasive carcinoma) in IPMN. The reported sensitivity, specificity, positive and negative predictive values and accuracy of these findings (with 2 or more present) for correctly characterizing these tumors as malignant are 83%, 81%, 85%, 78% and 82% respectively. Figure 3 Axial contrast enhanced computed tomography image at the level of the head of the pancreas shows a cystic lesion (asterisk) in the uncinate process of the pancreas with a hypoattenuating area (arrow) in the adjacent pancreatic parenchyma. Note the intrahepatic biliary dilatation (arrowheads) due to obstruction of the common bile duct (not shown) by the infiltrating mass. Invasive pancreatic adenocarcinoma arising from an intraductal papillary mucinous neoplasm was confirmed at pathology after a Whipple procedure. GB: Gallbladder. MRI depicts mural nodules in up to 60% of patients with malignant IPMN and 4% of patients with a benign or borderline IPMN. Wall enhancement in the MPD after gadolinium administration is also more common in malignant (74%) than benign tumors (21%). Malignant tumors have a larger median diameter of the MPD (18 mm) than benign lesions (11 mm) on MRCP. When analyzing the CT features of malignancy in IPMN, most lesions (93%) with mural nodules correlate with in situ carcinoma at histopathology whereas the majority (90%) of infiltrating masses represent IPMN with invasive carcinoma. The size of the MPD and branch duct on CT does not seem to correlate with the presence of invasive disease. The reported sensitivity and specificity of CT for detecting invasive disease are 81% and 96% respectively. The overall accuracy of CT for predicting surgical resectability is 74%. Using the standard CT criteria for adenocarcinoma, Viullerme et al reported a positive predictive value of 100% for determining resectable disease in patients with IPMN. However, the same authors reported a poor positive predictive value (17%) for the CT characterization of unresectable disease. This was likely due to the common peripancreatic inflammatory changes that occur in these patients secondary to pancreatitis which results in peripancreatic fat stranding mimicking carcinomatosis on CT.
MRCP is superior to MDCT for demonstrating the communication between the MPD and a branch duct, allowing for a higher specificity in the diagnosis of IPMN with MRCP[14,33]. This communication is visible on MRCP and CT in 73% and 18% respectively of patients with branch and mixed type IPMN. However, recent developments in multidetector CT technology provide superb, ultra-fast isotropic resolution of the pancreas which allows for multiplanar and curved reformations for demonstration of communication between the branch duct cyst and the MPD with a reported sensitivity almost equivalent to that of MRCP. MRCP also has a higher sensitivity than that of CT for detecting branch duct cysts due to the superior soft tissue contrast of MRI. The potential implications of a more accurate definition of disease extent when using MRCP in patients with IPMN for proper cancer risk stratification and treatment decision making have been recently highlighted. In addition, CT may overestimate the involvement of the MPD compared to MRCP using pathology as the standard of reference which could erroneously indicate the need for surgery. Multidetector CT examinations provide superior sensitivity and specificity than that of single-slice CT examinations for the detection of invasive cancer in patients with IPMN. However, it is important to emphasize that the malignant component of IPMN may not be detected by CT in up to 26% of malignant lesions. While the majority of these missed lesions represent < 1 mm foci of in situ carcinoma, large invasive tumors may go undetected on CT examinations. The authors’ experience parallels the aforementioned differences between MRCP and CT, with the former being their imaging technique of choice for characterizing cystic disease in the pancreas. However, the authors prefer the use of CT angiography (CTA) for pre-surgical staging of pancreatic adenocarcinoma because of the exquisite demonstration of the relationship between the tumor and peripancreatic blood vessels as well as anatomic variants in the arterial vasculature. Similarly, a dedicated CTA of the pancreas may be justified prior to surgery for those patients with IPMN in whom an invasive carcinoma is suspected. Not infrequently, more than one imaging examination (i.e. CT, MRCP and endoscopic US) is necessary for selecting the best treatment option because of the challenges involved in characterizing cystic lesions of the pancreas. The known malignant potential of IPMN and the increased detection of incidental asymptomatic pancreatic cysts due to the widespread use of cross-sectional imaging have resulted in an exponential increase of follow-up imaging performed for these lesions. The patient anxiety, radiation exposure and increase cost associated to repeated imaging may not be justified in all cases and follow-up strategies must be implemented. An international consensus statement for management of IPMN and mucinous neoplasm of the pancreas recommended follow-up with annual CT or MRI for small (< 1 cm), asymptomatic, simple cysts. In a recent study in patients without known or suspected pancreatic disease undergoing abdominal MRI at our institution, we found an overall prevalence of asymptomatic pancreatic cysts of 14%. The prevalence increased with age and patients older than 70 years had a cumulative prevalence of 40%. The mean diameter of the cysts was 7 ± 3.5 mm. These data support the idea that, much like renal cysts, incidental pancreatic cysts may be an acquired condition. Therefore, follow-up imaging of asymptomatic, simple (i.e. unilocular without internal architecture), small (< 1 cm) cysts may not be indicated. This approach should be particularly contemplated in older patients with other co-morbidities. Larger cysts and those with internal architecture, particularly in younger patients, require active surveillance with imaging. Multiphasic CT examinations of the pancreas should be avoided because of the cumulative radiation dose of repeated examinations. Trans-abdominal US should be used for thin patients in whom this approach allows for appropriate evaluation of the cyst. MRCP is the best alternative for following up these lesions when trans-abdominal US is not adequate. The need for gadolinium administration in follow-up MRI examinations has been questioned because of the ability of standard T2-weighted and MRCP images to demonstrate changes in size and internal architecture. The interval between follow-up examinations and the length of the follow-up period remains to be determined. The international consensus recommendations for imaging annually cysts < 10 mm, every 6-12 mo cysts 10-20 mm and every 3-6 mo cysts > 20 mm, for 2 years may now seem excessive. Given the overall prevalence of pancreatic cysts in asymptomatic patients and the substantial increase in number of cysts in the elderly population, new algorithms that take the patient’s age into consideration are necessary. The authors have recently implemented new guidelines for following up asymptomatic incidental pancreatic cysts at their institution (Table 1). With a better understanding of the natural history of these cysts, these recommendations may be modified in the future to decrease even further the number and frequency of imaging studies. For example, current recommendations for incidental pulmonary nodules detected on CT support avoiding further imaging of lesions < 4 mm in size for patients without risk factors. Similarly, the authors anticipate using a size cut off to safely avoid the need of additional imaging for incidental pancreatic cysts. Further research is, however, needed to elucidate the need for follow up of very small pancreatic cysts. Table 1 Follow up of incidental asymptomatic pancreatic cysts. To our knowledge, the duration of the imaging follow-up of pancreatic cysts has not been defined. Dismissal of a lesion after a defined period of confirmed stability would seem reasonable. Unfortunately, up to 11% of simple cysts undergoing active surveillance may grow and up to 5% may develop mural nodules on imaging; these correlate to adenoma and in situ carcinoma at pathology. The mean time for developing mural nodules is 8.75 years after the initial diagnosis. Furthermore, the development of invasive carcinoma in branch duct IPMN may occur 3-5 years after the initial diagnosis. However, the slow progression that is characteristic of these tumors may allow for spacing of the follow-up interval if no changes have occurred over several years. For patients undergoing surgical resection, an imaging follow-up strategy should be based on the ultimate pathological diagnosis given the differences in the rates of tumor recurrence between invasive carcinoma (up to 90% within 3 years of partial or total pancreatectomy) and patients with in situ carcinoma, and borderline and benign disease (0% and 8% within 3 years after total or partial pancreatectomy respectively). Disease recurrence in the pancreas after resection of an IPMN may occur in at least 7% in non-invasive IPMN. However, the benefit of follow-up imaging after resection of a non-invasive IPMN in an otherwise asymptomatic patient remains to be determined. It is also unclear if the frequency of pancreatic recurrence is related to positive margins at the time of resection although this does not seem to have an effect on the mid-term survival or tumor recurrence. Up to 40% of patients with a surgically resected IPMN with invasive carcinoma will relapse within 12 mo and their reported 5-year survival is 36%. The most common anatomic locations for relapse include the remaining pancreas, lymph nodes and distant metastases. Therefore, an abdominal CT or MRI at 3, 6 and 12 mo after surgery seems appropriate. After the first year, patients may be followed up every 6 mo. The characterization of intraductal papillary mucinous neoplasms (IPMN) of the pancreas on imaging studies requires an understanding of the histopathological features of this disease. Imaging findings on computed tomography and magnetic resonance imaging correlate tightly with the presence of malignant degeneration in these neoplasms. Even though the majority of incidental pancreatic cysts represent benign entities, many of these represent IPMN or other malignant etiologies such as a mucinous neoplasm and therefore an appropriate follow-up regimen is imperative. As of yet, there is no consensus as to the definitive management strategy for patients with a suspected IPMN. Follow-up strategies for patients with surgically resected IPMN must be tailored based on the presence or absence of invasive disease at pathology.